The protein encoded by this gene is a member of the dual specificity protein phosphatase subfamily. These phosphatases inactivate their target kinases by dephosphorylating both the phosphoserine/threonine and phosphotyrosine residues. They negatively regulate members of the mitogen-activated protein (MAP) kinase superfamily (MAPK/ERK, SAPK/JNK, p38), which is associated with cellular proliferation and differentiation. Different members of the family of dual specificity phosphatases show distinct substrate specificities for various MAP kinases, different tissue distribution and subcellular localization, and different modes of inducibility of their expression by extracellular stimuli. This gene product is localized to the nucleus and binds directly to RNA and splicing factors, and thus it is suggested to participate in nuclear mRNA metabolism. 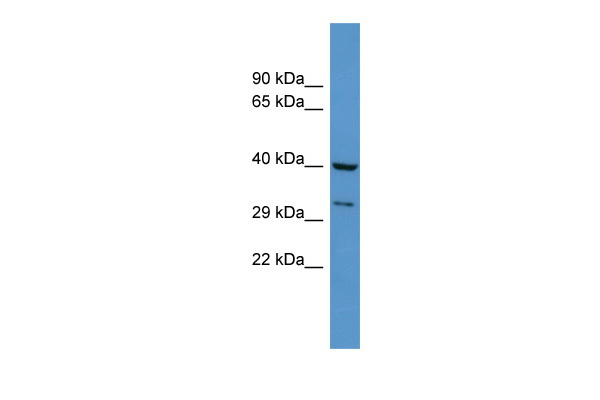 Western Blot analysis of DUSP11 expression in transfected 293T cell line (H00008446-T01) by DUSP11 MaxPab polyclonal antibody.Lane 1: DUSP11 transfected lysate(36.3 KDa).Lane 2: Non-transfected lysate.